Finally the much anticipated Pegasus World Cup. 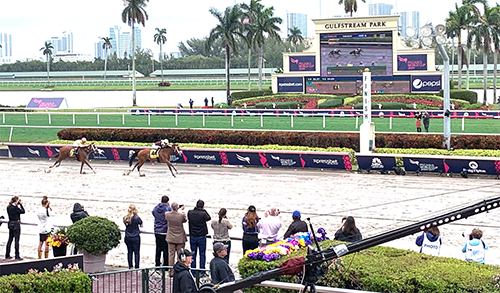 Although the weather has been wet and the track sloppy, it's still been very fast with several wire to wire winners. The sun starts to set as the gates are positioned right in front of the Winner's Circle. Patternrecognition went straight to the lead with Accelerate stuck in the pack. He held on to battle City of Light. But City of Light battled and pulled away for the win! Beating Accelerate for a second time in their careers. Final finish was City of Light, Seeking the Soul and Accelerate third. We hope everyone had a great day, despite the poor track condition and weather. Be sure and check out our picks for the remainder of the tracks running this evening and best of luck! 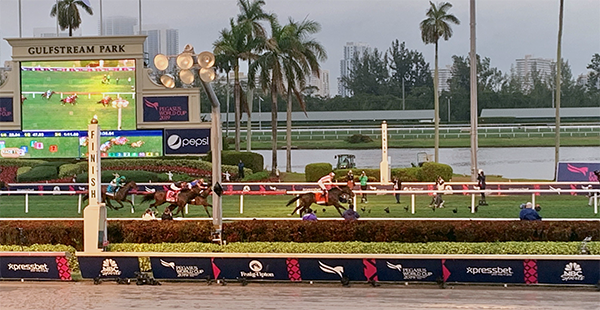 Now it's time for the inaugural Running of the Pegasus World Cup Turf worth $7 million. Fahan Mura, Aerolithe, and Dubby Dubbie set the pace. Aerolithe was hot and pressing. Opening half mile of :47.4. Catapult had the lead after the half. Delta Prince and Magic Wand pressed, but it was Bricks and Mortar pulling away by two lengths for the win. Magic Wand finished second and Delta Prince followed. 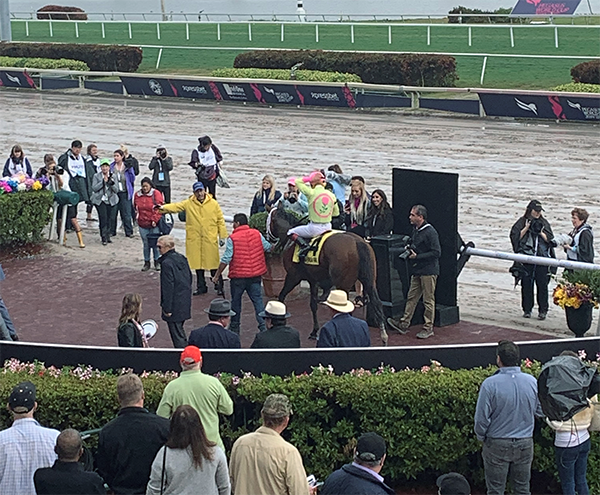 Trainer Chad Brown gets the win in the inaugural Pegasus World Cup Turf. It was Irad Ortiz Jr.'s third winner of the afternoon. Race 10 was the 52st running of the W.L. McKnight (G3). The race, worth $200k, is a Longines Gran Premio Latinoamericano Qualifying Race. This is another mile and a half turf race. Highland Sky, Markitoff and Postulation were all scratched, allowing also eligibles Sentry and All Go to fill the 15th and 16th post positions. All Go went straight to the lead creating a good distance. With the first pass by the grandstand, All Go was ahead by a neck. Coming into the far turn, All Go was ahead but Zulu Alpha battled on down the stretch. Zulu overcame to take the lead at the wire over Soglio with Hunting Horn rounding out the finish. It was a 1-2 finish for the Ortiz brothers. The rain was back for the $150k 33rd Running of The Fred W. Hooper (G3) at one mile. There were two scratches including Coal Front and Eye of Jedi. Before the start, Copper Town reared in the gate and dumped jockey Castellano. Castellano remounted and then they were off. Conquest Big E had the lead in the backstretch. Breaking Lucky behind but moved up to the lead at the turn. Around the turn Aztec Sense made his move to pull away from Breaking Lucky and Fellowship made a huge effort to take third in a photo finish. After race 9, the equine ambulance came for an injured Aztec Sense at the clubhouse turn. At this time, it is unclear what the injury was. Career victory 1000th for Jorge Navarro with the Hooper Stakes win, but it was bittersweet as he awaited information from the vet team. CONQUEST BIG has three wins in five races on off dirt. He could be an upset candidate. AZTEC SENSE might be the one to beat. He has three wins and two seconds in six off track races. UNBRIDLED JUAN's fortunes improve on an off track too. He's never finished out-of-the-money in six races 6: 2-3-1. The $200k La Prevoyante was a mile and a half on the turf for fillies and mares. At the break, Rahway, Top Cats and Ickymasho go to the lead with Trick Escape 7 lengths off. At the clubhouse turn, it was still Rahway. With a half mile to go, Santa Monica makes her move to go three wide, but Si Que Es Buena makes a move too and overpowers Santa Monica. The final finish was Si Que Es Buena, Santa Monica and Semper Sententiae. 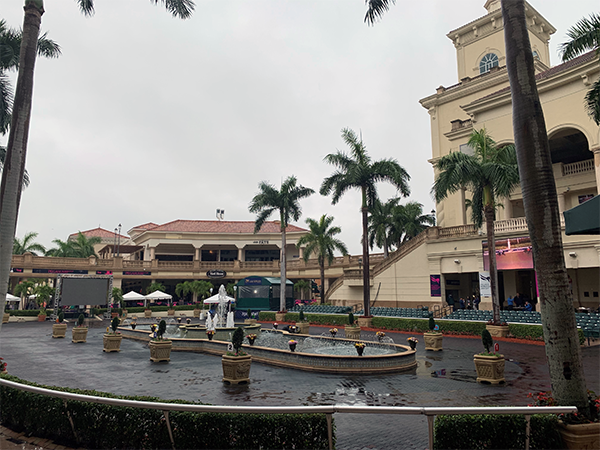 The clouds have parted some, but still no sun and a little bit of a sprinkle, as we move to Race #7 for The 21st running of $150k Fasig-Tipton Hurricane Bertie (G3). It was Victory Rally, Dream Pauline and Blamed setting the pace in the backstretch. Around the turn Blamed took the lead, but Dream Pauline made the move on the stretch to take the win by three lengths. Pacific Gale finished second with Stormy Embrace third. Dream Pauline is owned by Stonestreet Stables and trained by Kiaran McLaughlin. Morning-line favorite SHAMROCK ROSE has not run on an off track and failed to hit the board in her lone turf race, which sometimes translates. The surface change makes her a vulnerable favorite because of the unknown. BLAMED has also never run on an off track; however, front runners tend to carry their form on slop/mud. DREAM PAULINE is one for one on an off track in a tough back and forth race in her last race, which was at Gulfstream Park. Longshot MS MESHAK scored her widest margin win on a sloppy track. She might be a nice play on the backend of exotics. STORMY EMBRACE has the most off track experience with a win and two seconds in four races. Race #6 moved to the grass for The 10th running of the South Beach Stakes at 7.5 furlongs. Mark Casse wasn't sure in the pre-race interview how Road to Victory would handle the soft turf. The 4 year old by Quality Road did beat Eclipse Award winner Monomoy Girl at Churchill in 2017. Capla Temptress scratched early. Road to Victory and Everyonelovesjimmy Set the pace and were heads apart in backstretch. It was a close pack of horses with only 7 lengths from first to last. Around the turn Dolce Lili came from way back and closed for the win, followed by Conquest Hardcandy and Fire Key. Road to Victory finished at the back of the pack. For Race #5, Surrender Now, Miz Mayhem, Painting Corners, Morticia, and Blue Bahia were all scratched leaving us with a five horse field. Cherry Lodge took off for the lead. Just Talkin' followed in second. Around the turn Just Talkin' challenged but Cherry Lodge held her ground by a length and a quarter. Razorback Lady hung on to finish third behind the pair. Cherry Lodge is owned. Y Gainedway Stable and trainer by Todd Pletcher. For the sixth race, the turf has been downgraded to "yielding". For those that wagered on our updated top 4 picks in Race #5 (see below) then you would have hit the $22.60 exacta, $92.80 trifecta and $161.60 superfecta. Congrats if you cashed in! Race #4 was a $60k Maiden at one mile for three year olds. The field of 13 broke awkwardly. Hidden Scroll set the pace with Robintakecharge just behind with :44.3 at half mile. Hidden Scroll continued to lead by seven lengths around the turn. He's obviously allergic to the mud and made sure he crossed the wire cleanly to take the win by 10 lengths. He was followed by a muddy field with High Amplitude finishing second and Ranger Up finished a hard fought third coming from well behind the pack. Owned by Juddmonte Farms and trained by Bill Mott. 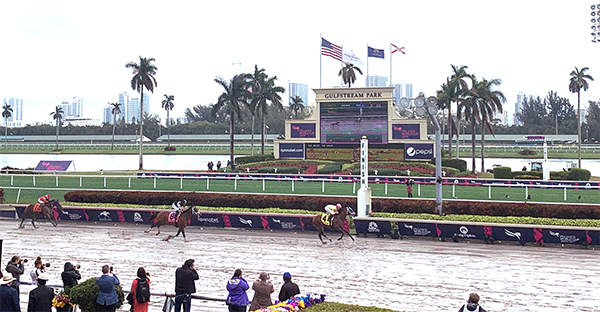 The rain stopped for Race #3, the 9th running of the Gulfstream Park Turf Sprint worth $150k. There were several changes to this race today as it was moved from the turf to the track, which is sloppy. With the scratches, the race was left with a field of five. World of Trouble and Recruiting Ready went straight to the front, three lengths ahead of the rest of the field. It was all World of Trouble to the wire followed by Recruiting Ready and Belle Tapisserie. Singandcryindubai finished fourth followed by Little Chedney who was never a factor. Race #2 was the Thoroughbred Aftercare Alliance $54k Allowance Optional Claiming at 7 furlongs. Love Tree stumbled and dumped his jockey at the start. Minute Madness, Polar Jet and Souper Wish set the pace. Minute Madness took the lead around the turn and fought for the win with Charlie the Greek in second and Coop Tries Harder in third. Stewards inquiry on Love Tree with no action. PEGASUS WORLD CUP DAY - RACING ROULETTE? If you're watching Gulfstream live streaming you may be wondering what this horse racing roulette thing is. Available via Xpressbet, Horse Racing Roulette works by placing horses into three different groups. The groups are red, black and green just like a roulette table. If you're at the track, they are marked in the program. Players win when a horse from the designated color group finishes first. 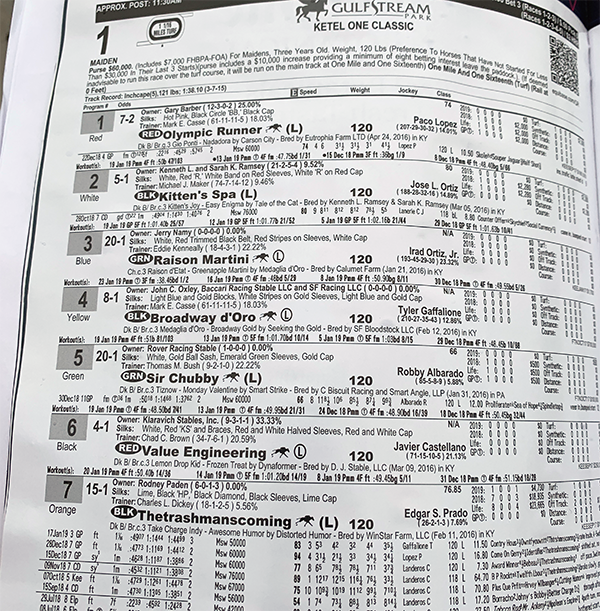 The field requires a minimum of six horses with a $2 minimum. Our BEST BET of #1 OLYMPIC RUNNER takes the opener which was moved off the turf to the dirt. Paid $4.60 so doubled your money if you bet on our top pick. Trainer Mark Casse took the win with Olympic Runner who dominated the 1 1/16th miles on the inside. Thetrashmaniscoming took second followed by Midnight Oasis. 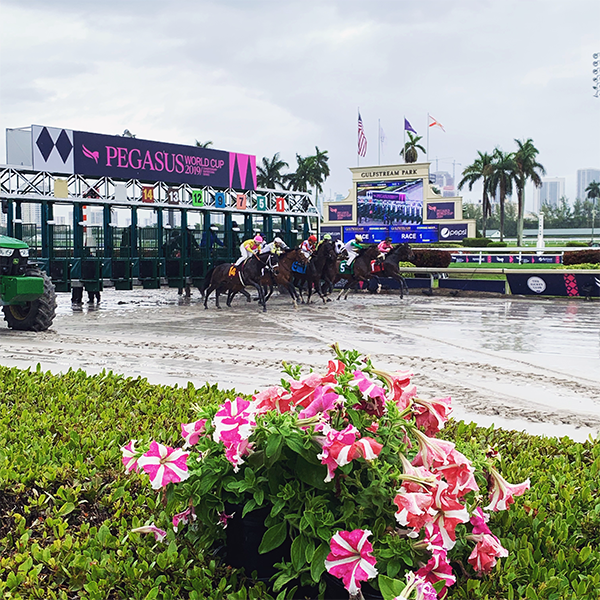 The rain is coming down much harder now at the Pegasus World Cup. The weather has caused some major changes to some of today's races. The track is sealed but it is a sloppy main surface. 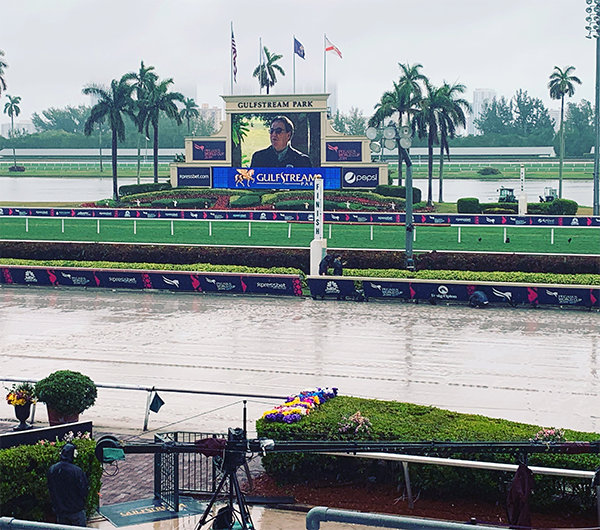 So far races 1, 3 and 5 have been moved off the turf affecting the Gulfstream Park Sprint Stakes and the Ladies' Turf Sprint Stakes. In Race 3, Stormy Liberal, Pay Any Price, and Oak Bluffs have been scratched. In Race 5, Blue Bahia, Miz Mayhem, Painting Corners, and Morticia have all been scratched. The South Beach Stakes will be run on the turf, which is rated good and so far Capla Temptress has been scratched. It's a rainy day in Hallandale Beach, Florida and it doesn't look like it's going to break until later in the afternoon. As of right now the main track is rated as SLOPPY SEALED and the Turf is GOOD. The Pegasus World Cup became the world's richest horse race in 2017, when the race was introduced by Gulfstream Park. Open to four-year-olds and older, the inaugural running of the Pegasus offered a $12 million-dollar purse. 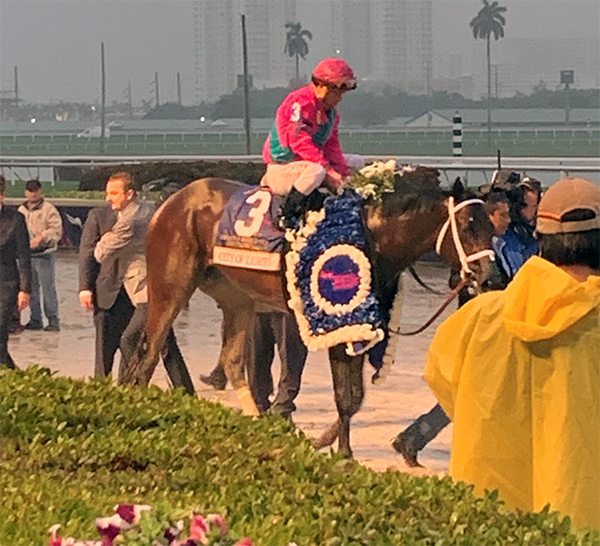 New to 2019 is the Pegasus World Cup Turf. This race has drawn some international entries including AEROLITHE from Japan. In the Pegasus World Cup Invitational, all eyes will be on ACCELERATE in his final race before heading off to the breeding shed. There will be several other familiar faces and foes up against him though including CITY OF LIGHT and GUNNEVERA. 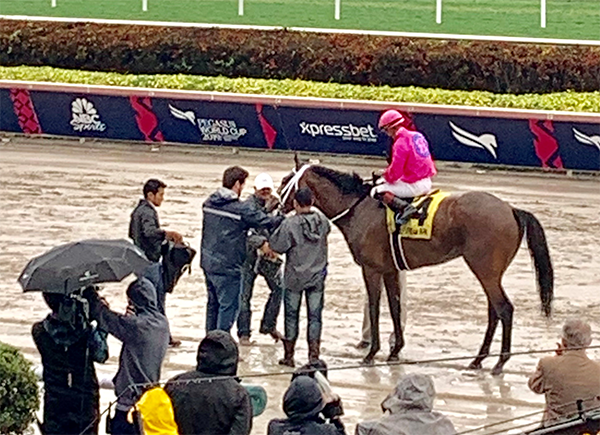 Of course, with the addition of some new international blood in KUKULKAN, you never know what might happen this afternoon at Gulfstream Park. Stay tuned and we will provide you updates live here as the racing action at Gulfstream gets underway! There's an undercard full of stakes races, including several Eclipse Award winners like STORMY LIBERAL and SHAMROCK ROSE. GET OUR FULL CARD PEGASUS PICKS AND WAGERING GUIDE!